It’s getting quite frightening, just how relevant these daily prompts are to my life. They all seem to fit in too neatly with what’s happening to the day they’re given out. Today, this would be a perfect opportunity to say, again, how pleased and proud I was to receive an award from someone who follows my blog. However, I thought I would instead send my praise elsewhere. This post will be devoted to my Sister. My sister was recently featured in a local newspaper as a Queen of Cupcakes. (She certainly doesn’t take after our Mother…) My Sister and her husband have four young children between the ages of 12 and 2. As you can imagine, she’s a busy mummy! However, due to the economic climate that she lives in, and the continued amount of government cuts. She receives less and less help for general childcare costs. She has always been an enterprising lady and so, two years ago whilst I was visiting (she lives abroad sadly) she told me that she was going to sell cupcakes. She’d perfected a recipe and was going to start giving the local indoor children’s play area, 12 cupcakes to sell on a Thursday. She was worried that they wouldn’t sell. That no one would want chocolate cupcakes, in a recession, cake isn’t a necessity. I remember sitting in the car, as she made the first delivery. She came back and shrugged. It would either work, or we’d throw any remaining cakes away. It was no real loss, and it had been worth a try. Two days later, the play area phoned her and asked for some more cakes. 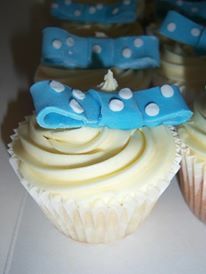 It had been horrible weather, the play area had been packed and the delicious chocolate and vanilla cakes had sold out. I was really proud of her. Two years later, and my sister provides cupcakes to a variety of local shops and to the same play area. She also takes orders for birthday, christening, communion and wedding cakes. After starting as a novice, she’s built a respected small business. My Sister is a wonderful person and one really smart cookie too. I feel very proud to have such a kind, beautiful, enigmatic and exciting woman in my life. She truly is brilliant and it all just goes to show; whatever ever you dream of doing, whether it’s becoming a cake baker, florist, author, sculpture, bus conductor – anything. Give it a go – see where you end up.